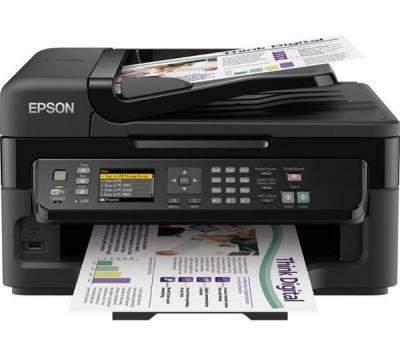 Buy Printer Epson WorkForce WF-2540WF with CISS and make 30 times more quality prints for the same money! 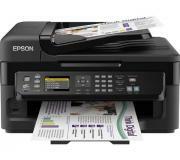 Epson WorkForce WF-2540WF is an inkjet В«All-in-OneВ» printing device which can print, scan, copy and fax various documents. This space-saving device can perfectly satisfy the needs of a small office which requires continuous and stable operation, proper printing and high productivity. This device is provided with all the functions you need for your daily paper work at home or in the office. Besides, we would like to recommend you another MFD with similar properties and good price. It is Epson Stylus TX117 MFD, which is presented on our shopping site as well. This equipment is intended for business use and it will be a reliable assistant for you in all your office missions. As the designers of Epson Company take care of their Customers constantly, they equipped the device with a great variety of connection types. The MFD uses Ethernet interface, which enables any PC User, who works inside the office, to print, scan and copy various documents or exchange correspondence with help of one office device at the same time. This gadget will be appreciated with those who are engaged in small groups for their common business and use only one MFD altogether in their general office. The next feature of the device, worth our mentioning, is its high operating rate. It can reach 34 pages per minute in one-color mode and 18 pages per minute in full-color one, and besides, it will take you only 38 seconds to print one 10 x 15 cm photo with the WF-2540WF printer. And it is great for such a machine, especially as all kinds of printed stuff will look bright and accurate! The color scanner of the device has resolution of 1200 x 2400 dpi, which helps to create real images on the PC monitor. The MFD control panel is equipped with a 6.3 cm LCD, which is one more distinctive property of the device and which was missing in all the previous models. With its help you can choose and enter any stuff to be printed, and what is important, you can make corrections in it. Epson Company is one of the leaders at the market of printing equipment and its machines are quite popular with Users, because they use all the latest innovations. One of them is piezoelectric technology of printing, which is inherent in all Epson inkjet printing devices. This printing technique helps the printer to create the smallest possible ink drop and precisely apply it onto a paper sheet. Besides, the Epson WF-2540WF printer is equipped with a MicroPiezo print head which assures high printing rate and perfect quality of prints as well as long and trouble-free operation of the device as a whole. Additionally, we should say, that this device is provided with plenty of useful gadgets, which extend its capabilities. For example, it uses Epson Connect, which helps to install wireless communication with the device in order to control printing process from your Smartphone or any PC. And what is more, now it is possible to manage your printing from any other place in the world via I-net. The device, we offer, has everything to provide you with such kind of service, which is called "Cloud Print". There is another useful property, which lets you select and print photos directly from a digital camera. It is PictBridge interface. So, the inkjet printing device, we offer completely complies with the present-day demands and has everything to make your office work as pleasant as possible. Inkjet printing devices are considered to be inexpensive as compared with other printer types, but the problem is, that their consumables cost too much. The best way to solve it is to equip your MFD with Continuous Inkjet Supply System, which will surely decrease your printing expenses by 30-40 times and save a lot of your working time, because you will no more need to waste it on cartridge replacement or refill. INKSYSTEM Company offers a great variety of reliable CISSs which can perfectly work together with any printer or MFD model. Among them there is Epson Stylus CX9300F, which you can purchase on our shopping site. To sum up all the information mentioned above, we should say, that soon our Epson WF-2540WF All-in-One printer will surely take place of a bestseller at the market of office facilities due to the wide range of the services it can provide.